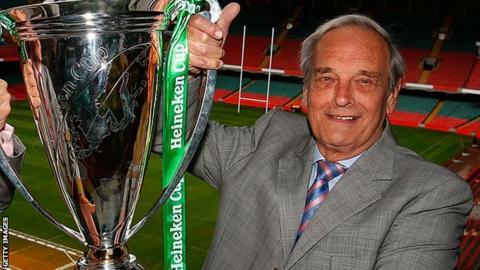 A former Rugby Football Union chairman has urged the Celtic nations to stand up to the "bullying" of "arrogant" English clubs over the European TV row. Martyn Thomas believes the English clubs must be told to get in line or be kicked out of the Heineken Cup. Premier Rugby, which represents England's top 12 clubs, is in conflict with European Rugby Cup Ltd.
"There's only one thing you can do when you have a playground bully on you and that is to punch back," said Thomas. "Until you do, you will be bullied. I think that is the situation that prevails now. Heineken Cup qualification for Welsh regions is currently based on how they finish amongst themselves in the Pro12 season. The top three are guaranteed a place in European rugby's premier tournament, with the fourth entering the second tier Amlin Challenge Cup. Three of the four Irish provinces are guaranteed a place, with the two Scottish and Italian clubs qualifying regardless of where they finish in the table. The English and French clubs want a tougher qualification process where the top six sides, regardless of nationality, would qualify for the tournament. This is the criteria facing Aviva Premiership and Top 14 clubs. "I think the Celtic unions and Italy have got to stand together and say 'look this is a team effort, either you want to negotiate and work with us to improve the revenue for all of us to make a better game and a greater spectacle, or get out'. "The time has come for the Celtic unions to actually say that." ERC, the governing body of the Heineken Cup, believes Premier Rugby exceeded its powers by selling European rights to BT Vision for three years from 2014 in a £152m, four-year agreement. English and French clubs announced during the summer that they planned to withdraw from the Heineken and Amlin Challenge Cups when the current agreement governing the competitions expires in 2014. As well as wanting to cut the Pro12 contingent in the Heineken Cup from 10 to six, they believe the value of European rugby is being undersold. The Premiership deal with BT Vision covers games from next season, but also includes a three-year arrangement to show live European matches involving leading English clubs. He also accuses the English and French clubs of arrogantly believing they are the powerhouses of European rugby. "The English and French clubs are arrogant enough to believe that they are the driving force of Europe and want a greater share of the broadcasting cake," he said. "They believe they have the right entitlement to demand more for playing in the competition. If you look at last year's competition we had two Irish sides in the final. "The English and French clubs seem to regard Wales, Ireland and Scotland, and to some extent Italy, as junior partners, but without opposition, there is no game." Thomas admits he understands the motives of English and French clubs, but believes they are not operating in the best interest of European rugby. "One can have a degree of sympathy, but to put the competition in jeopardy in the desperate pursuit of money, I don't think it is the right thing to do," said Thomas. "The competition has gone from strength to strength and it's the next tier of rugby below international rugby."